Dr James A.T. Lancaster is an intellectual historian who received his PhD from the Warburg Institute in the University of London. 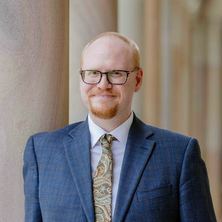 James is currently a UQ Postdoctoral Fellow at the Institute of Advanced Studies in the Humanities (IASH) at the University of Queensland, where he is undertaking three years of research for his next monograph. In addition, James is a board member of the Oxford Francis Bacon critical edition, in which capacity he has been responsible both for compiling the most comprehensive bibliography to date of both editions of the works of, and secondary sources on, Francis Bacon, as well as co-editing the De augmentis scientiarum (OFB X). His publications include: ‘The Semantic Structure of Evolutionary Biology as an Argument Against Intelligent Design’ in Zygon: Journal of Religion and Science; ‘Natural Knowledge as a Propaedeutic to Self-Betterment: Francis Bacon and the Transformation of Natural History’ in Early Science and Medicine; ‘Natural Histories of Religion: A (Baconian) “Science”?’ in Perspectives on Science; and a chapter, ‘Francis Bacon on the Moral and Political Character of the Universe’, in his co-edited volume with Guido Giglioni, Francis Bacon on Motion and Power (Springer, 2016). ￼￼Natural histories of religion: a (Baconian) "science"?